Here are some of the apps I use while learning Dutch (or when I want Dutch news). I generally only post free apps (well, free for iPhones). Note: I own an iPhone, so the list is a bit skewed. However, if I can find an Android version of an app I do post it. Feel free to mention Dutch apps you like in the comments and I will add them to the list! So far I have only played with the free version, which lets you oefenen (practice) without any timer. You can also play online against random other players. That is most definitely not my thing! Not even with an English app. If you upgrade to the Pro version it looks like you can also play with a timer at easy, medium or hard levels. I’m perfectly happy with the practice level, of course. It takes long enough as is. It is harder than it looks, especially for buitenlanders (non Dutchies), but without a timer it allows you to play at a more leisurely pace and thus look up any answers that you didn’t know existed before! This app is a vocabulary word list. They give you that word in an example sentence (English and Dutch). Although the official title of the app is Dutch Word of the Day, it does not seem to provide a new Dutch word each day. And you have letters beneath. You have to fill in the blanks from left to right, clicking on each letter in order. Once you start getting used to Dutch spelling rules, you will start to see patterns. For example, the end of the word is probably -lijk, so you don’t want to click on the l, j, or k just yet. The actual word is fatsoenlijk. Sometimes the game is hard (you have to fill in all of the letters) and sometimes it is easy (you only have to fill in two letters, and both happen to be o!) but at least you see the word again. Sometimes the game gives you the English and requires you to input the Dutch, and sometimes it is the opposite. 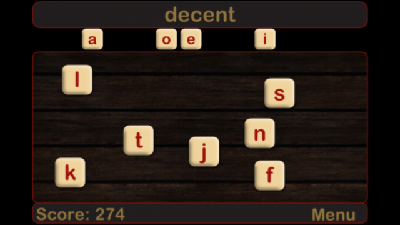 Occasionally the game will give you more letters than you need to try and confuse you. This is a pretty interesting game which requires you to move around letters to find and make a Dutch word. It’s a newer app (Nov. 2012) and is consequently still a bit rough around the edges as it crashes occasionally. It is highly recommended that you read the instructions on the official Apple app website, because they are not repeated in the game itself. You start with a mostly empty board, with six letters in random places. Step 1: Tap a letter to select it (image 2). Step 2: Tap a square to indicate where you want it to move to (image 2). Note: You can only move a letter to that square if there is a clear path for it to get there. Step 3: Swipe a word to get it to disappear and gain points (image 1). The words can be left to right, right to left, up to down, or down to up. Note also the magnifying glass – that is a Dutch-English dictionary that shows you the definition for the last legal Dutch word you played. Also note the three letters at the top left (ATT, AXT). These are the three letters that will appear at the next turn in a random place. You can also press the reset button to reset the board. As mentioned above, the game crashes occasionally, but not too often. You can leave the game and return to it by pressing the home button with no consequences (for example if you wanted to open a dictionary program which might give you some ideas of what words to look for). Guess Words is a Hangman type app made for Dutch, English, French and German. English is the default language but you can switch to Dutch in the settings. This app does not get the best reviews, but if you are looking to learn random vocabulary, it should be useful. When you first start to learn Dutch, this app might be more frustrating than helpful because you do not have a large vocabulary to work with. Instead, you will just find yourself picking random letters (usually vowels or R, S, T!) in the hopes that something will pop up. The free version is limited to five letter words, although the paid version allows for three to seven letter words. This app also gives you the option of entering a word yourself (up to 12 letters) and then having your partner guess it. Muiswerk is a Dutch dictionary app (no English). The app contains about 40,000 common Dutch words. Each word has a definition and at least one example sentence. Afterwards, some words include uitdrukkings, or phrases, which are used within the Dutch language. 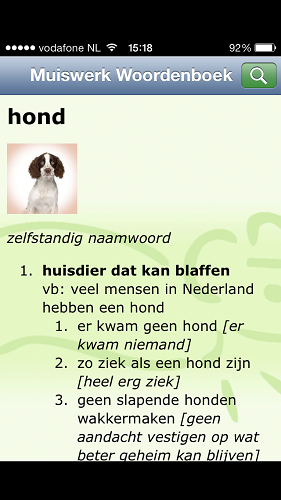 For example, you can see below “geen slapende honden wakkermaken” — don’t wake a sleeping dog — with the definition [geen aandacht vestigen op wat beter geheim kan blijven]. This saying is similar to the English saying ‘let sleeping dogs lie’. In addition, verbs include the conjugations (ik schrijf, hij schrijft) and each page includes links to words used on that page (meer informatie bij…). For example, if you did not know what aandacht was you could click the link and be taken to the aandancht page. This app provides the same support you would expect to see with the browser version – translations back and forth. However, it does not provide a way to let you choose the voice. It also only provides an audio option for the end text of what is translated – so you can hear the Dutch if you start with the English first. But if you are trying to translate a Dutch phrase you found, you cannot translate it and then hear the Dutch being spoken. This Dutch studying app has two versions: a free version with 132 words so you can try it out, and a paid version ($9.99) with 2,100 words. You can select which categories you want to study (colors, numbers and counting, weather, and more). You also have a flashcard option, quizzes, audio quizzes, statistics, and the ability to make your own study sets. I liked this app, I just didn’t want to pay $9.99 for more words. The free version is just a taste of what it can offer. The paid version would be good for those who need to learn basic vocabulary quickly. This is a new website/app that I had just heard about. Currently there are 44 lessons for English-Dutch, and the user has the ability to make more (and make them public). The app version allows you to see the contents of each lesson (the english word and then the Dutch translation), with audio for both sides. There is also pictures for each of the words introduced, and a quiz to help you memorize the words. You are allowed to keep choosing the answer until you get it right, but since the choices for each of the quiz questions is one of the words in the lesson (rather than words designed to trip you up because they look similar), it’s not that hard of a quiz. Choosing the wrong answer will cause it to appear later on in the quiz. NOTE: To view the lessons offline, you must first open each lesson when you have an internet connection so that it is saved to your device. After that, you no longer need an internet connection. This flashcard app has a free and paid version. It is not a Dutch app per se, so you can use the flashcards for anything. I find the method of entering flashcards rather simple, as I just have to upload a .txt file with the questions and answers. You can customize the thoroughness of the quizzes, as well as the formatting (bold, italics, underlining, etc) of the cards themselves. It also very easy to move your flashcards from your PC to your iTouch and vice versa. This is an app for one of the more well-known Dutch news websites. Along with delivering the news it includes such extras as the weather, traffic, the stock market, and a TV listings guide. The wikipedia page states that Teletekst is an informational retrieval service. You can flip to this channel to get national (binnenland) news or international (buitenland) news. You can also check the weather, get sports scores, see financial information, get traffic updates, and more. Also in some cases if you change teletekst to page 888, you will see subtitles for the program you are currently watching. This weather app shows you radar and satellite views to let you know where the rain is currently falling in the Netherlands and Belgium (my bet: everywhere). It also mentions traffic and accidents. This public transportation app is all but essential if you don’t have a car in the Netherlands. It shows routes and times for the tram, train, bus, subway and ferry from point A to B. You can also create an account and save locations to your device so you don’t have to enter them each time. Dutch Masters – follow the Dutch painters from the famous Dutch museum that begins with an R which I can’t spell. Do Euro 2012 apps count? Euro 2012 apps? Cool. I won’t add it to this page since it’s going to be more for permanent type apps, but I might just download Euro 2012 stuff for myself. Thanks for the advice! I KNEW you were gonna comment on the weather app.